1) This paper is a peer review paper that was presented at the FIG Working Week 2017. Wallace Mukupa received a ph.d. grant from FIG Foundation in 2016 and one of the results is this peer review paper. In this paper, a hybrid method for correcting intensity data is presented. The utilization of Terrestrial Laser Scanning (TLS) intensity data in the field of surveying engineering and many other disciplines is on the increase due to its wide applicability in studies such as change detection, deformation monitoring and material classification. Radiometric correction of TLS data is an important step in data processing so as to reduce the error in the data. In this paper, a hybrid method for correcting intensity data has been presented. The proposed hybrid method aims at addressing two issues. Firstly, the issue of near distance effects for scanning measurements that are taken at short distances (1 to 6 metres) and secondly, it takes into account the issue of target surface roughness as expounded in the Oren-Nayar reflectance model. The proposed hybrid method has been applied to correct concrete intensity data that was acquired using the Leica HDS7000 laser scanner. The results of this proposed correction model are presented to demonstrate its feasibility and validity. Correction of intensity data is essential due to systematic effects in the LiDAR system parameters and measurements and in order to ensure the best accuracy of the delivered products (Habib et al., 2011). The whole aim of radiometric correction is to convert the laser returned intensity recorded by the laser scanner to a value that is proportional to the object reflectance (Antilla et al., 2011). This correction of intensity data is still an open area of investigation and this is the case because even though a couple of researchers have studied the subject of TLS intensity correction for instance, a standard correction method that can be applicable for all the various types of laser scanners is non-existent (Penasa et al., 2014). Such a scenario is also explained by some of the laser scanning research work that are still being published without the intensity data having been corrected (Krooks et al., 2013). However, in Tan and Cheng (2015), it is purported that the proposed intensity correction method is suitable for all TLS instruments. In the case of Airborne Laser Scanning (ALS), the subject of intensity data correction has an old history compared to TLS and this has been reported by researchers such as Kaasalainen et al. (2011). It has been reported that the effect of the measurement range (distance) on the intensity data depends on several parameters. In the case of TLS, the effects of the range tend to depend on the instrument especially when measurements are taken at close range to the target. The effects of the range on TLS intensity or the dependence of the received power as a function of the range is proportional to 1/R2 (R = range) in the case of extended diffuse targets (Jelalian, 1992). This implies that the whole laser footprint is reflected on one surface and it has Lambertian scattering properties. However, non-extended diffuse targets exhibit different range dependencies. For instance, point targets (e.g. a leaf) with an area smaller than the footprint are range independent and targets with linear physical properties (e.g. wire) are linear range dependent. Therefore, the range dependency becomes 1/R4 for targets smaller than laser footprint size and 1/R3 for linear targets (Vain and Kaasalainen, 2011). According to Krooks et al. (2013), different scanners have different instrumental effects on the measured intensity and this implies that it is prudent to study each scanner individually. Instrumental effects have been reported to affect the intensity recorded for TLS instruments. Even though distance has been predicted to follow the range squared inverse (1/R2) dependency for extended targets based on the physical model (radar equation), in practical applications this prediction is inapplicable at all ranges because of TLS instrumental modifications that are designed to enhance the range measurement determination (Holfe and Pfeifer, 2007; Balduzzi et al., 2011; Antilla et al., 2011). In a similar vein, Kaasalainen et al. (2011) state that the knowledge of the TLS instrument as to whether it has near-distance reducers or logarithmic amplifiers in the case of small reflectance is of cardinal importance in an attempt to know the distance effects and the extent to which the measured intensity is affected by instrumental effects. In Kaasalainen et al. (2009a) it is has been reported that measurement of the intensity taken at short ranges, 1m in this case have been significantly affected at such near distances by brightness reducers. The effects of the incidence angle on the intensity are related to the scanned target object in terms of its surface structure and scattering properties (Krooks et al., 2013). In terms of the rugosity of the target, macroscopic irregularities of the order of mm to cm size and almost the same size as the laser footprint, neutralize the effects of the incidence angle on the intensity. This is so because there are always elements on the surface of the target that are perpendicular to the incident laser beam (Kaasalainen et al., 2011). In a similar vein Penasa et al. (2014) states that the effects of the scattering angle can be neglected if the surface roughness of the target is comparable with the laser spot size. Other studies for instance Kaasalainen et al. (2009b) showed that the significance of the angle of incidence only becomes an important parameters when it is greater than 20° for several materials. The strength of the signal that the scanner receives is dependent on the backscattering properties of the target scanned (Shan and Toth, 2009). If the surface backscattering the laser is an extended target and a Lambertian reflector, the backscatter strength in the angular domain depends entirely on the incidence angle. Different TLS intensity correction models have been proposed and some methods are based on the physical model (laser range equation) whereas others are modified versions of the physical model and some are data driven. For instance in Balduzzi et al. (2011) the modified radar range equation was used to correct the intensity data. It is reported that the laser scanner (FARO LS880) which was used has an intensity filter and with the assumption that this filter has only an impact on the intensity variations due to distance, the range squared inverse law was replaced by a device specific distance function and then a logarithmic function was applied. In Kaasalainen et al. (2008), an important consideration was the effect of the logarithmic ampliﬁer of the FARO LS HE80 for small reﬂectance. The logarithmic correction was calibrated by ﬁtting an exponential function. In Penasa et al. (2014) an intensity correction approach for distance effects and exclusive of other variables such as incidence angle or atmospheric losses is presented. The correction approach did not apply the radar equation instead it is stated that the correction was based on estimating a correcting intensity-distance function on an appropriate reference point cloud via a Nadaraya–Watson regression estimator. In Blaskow and Schneider (2014) an intensity correction approach is presented which involves polynomial approximation and static correction model. Under the polynomial approximation, the intensity-distance curves were functionalised as basis for the static correction model and the Spectralon target data served as reference. Pfeifer et al. (2007) investigated data driven models and a function, F(ρ, α, r) was sought to predict the intensity value from range (r), reflectivity (ρ) and incidence angle (α). To correct the intensity for the effects of target reflectivity and incidence angle, different functions were tested. The function which brought the curves to the closest overlap was (ρ cos(α))-0.16 and all intensity values were then multiplied by this function to remove the influence of target reflectivity and angle of incidence. Two linear functions were then fitted to correct the intensity for distance effects. In Franceschi et al. (2009) a study was undertaken that focused on using TLS intensity data to discriminate between marls and limestone, the corrected intensity was taken to be related and proportional to the target reflectivity and an assumption was made that the scanned objects were Lambertian reflectors. In Fang et al. (2015) an intensity correction method is presented based on estimating the laser transmission function so as to determine the ratio of the input laser signal between the limited and the unlimited ranges and then integrating this ratio in the radar range equation in order to correct the intensity data near distance effects. Tan and Cheng (2015) developed a model to correct the effects of the angle of incidence and the distance on the intensity data. The proposed correction model is approximated by a polynomial series based on the Weierstrass approximation theory and an approach to estimating the specific parameters is presented. Using a similar approach, Tan et al. (2016) proposed an intensity correction method for distance effects where the range squared inverse law as described in the radar equation and the ALS range correction methods was replaced by a polynomial function of distance. Zhu et al. (2015) investigated the use of TLS intensity data to detect leaf water content and an intensity correction method is described where firstly a reflection model was employed to get rid of specular reflection which was as a result of leaf surface at perpendicular angle and then reference targets were utilised to correct the effects of the angle of incidence. 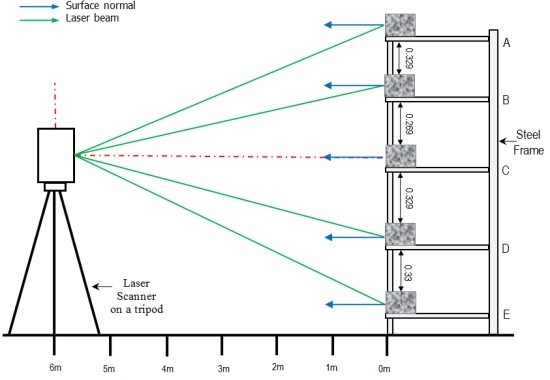 In view of the above, this study aimed at correcting the TLS returned intensity for concrete by looking at methods of modelling the variables that have an effect on the intensity values of the laser in this case the effects of the measurement range and incident angle since the experiment was carried out in a controlled environment. The focus of the investigation was to use existing models of laser behaviour to develop a correction model for TLS intensity data that is also capable of addressing near-distance effects and surface roughness of the target since not all objects are perfect Lambertian reflectors. The proposed hybrid intensity correction method is based on the radar equation (Jelalian, 1992), near-distance correction model (Fang et al., 2015) and the Oren-Nayar reflectance model (Carrea et al., 2016). These existing models and the development of a hybrid intensity correction model are explained in detail in the data processing section. A description of the experimental procedure for testing the proposed hybrid method for correcting intensity data is provided and the results of this correction model are presented to demonstrate the feasibility and validity of the method. Prismatic concrete beams (Fig. 1) were used as scanning target objects mainly because this is part of an on-going project investigating the use of laser intensity for the assessment of fire-damaged concrete. Since surface roughness of the scanned object was of interest in this study, it is worth mentioning that the concrete consisted of fine aggregate (river sand) with a maximum grain size of 5 mm and crushed siliceous coarse aggregate with a diameter ranging from 5 to 20 mm. 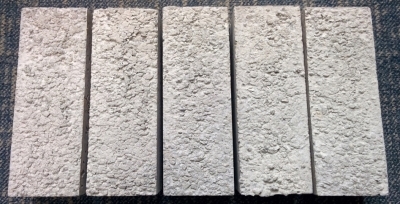 For easy identification, the concrete specimens were labelled as: Block C, Block 1, Block 2, Block 3 and Block 4. The experiments were conducted under controlled laboratory conditions. The factors affecting the returned intensity under such conditions are the scanning geometry and the instrumental effects. Since the experiments were carried out in a controlled environment and at short range (1 to 6m), atmospheric losses were neglected. The Leica HDS7000 laser scanner (Fig. 2) was used to scan the concrete specimens and the technical specifications of this scanner are as presented in Table 1 below. The measurement distances between the HDS7000 scanner and the target objects (concrete specimens) were ranging from 1 to 6 metres and the total station was utilized in marking out the scanning distances. The steel frame where the blocks were placed was levelled using a spirit level and then the distance to the prism placed right on the edge and centre of the steel frame was measured. Distances up to 6m in steps of 1m were measured using a total station so as to have scans taken from well-known accurate distances. The geometry of the experiment in terms of scanning measurement setup is shown in Fig. 3. Fig. 3: Laser scanner and blocks at different levels on a frame (Letters A, B, C, D and E stand for shelf levels). With reference to Fig. 3, the planar surface of each concrete block was properly aligned with the frame edge with the aid of a mark which was made on the centre of the block and the frame too. These measures were carried out so as to position each concrete block at approximately the same required distance from the scanner for each respective scanning session. Independent measurements using a steel rule and tape were carried out to ensure that each concrete block was accurately oriented. The experiment was set-up this way in order to only focus on the scanning geometry which consists of the angle of incidence and the range between the scanner and the target object (Krooks et al., 2013; Kaasalainen et al., 2011) as the factor influencing the poor laser returned signal. The concrete blocks were placed at different heights on shelves of the steel frame with the control block on the centre shelf at the same height as the scanner with its front face approximately vertical and perpendicular to ensure that scanning was done at roughly normal angle of incidence. The scanning parameters used in the experiments involved super high resolution and a normal quality. The proposed hybrid intensity correction method consists of two parts, namely the near-distance correction model in Fang et al. (2015) and the Oren-Nayar correction model described in Carrea et al. (2016). In principle, the hybrid intensity correction method has a basis in the radar (range) equation (Eq. (2)) and so an overview of this equation is presented and then it is followed by the correction for near-distance effects and the Oren-Nayar reflection model. The radar (range) equation (Eq. (2)) consists of three main components and these are: the sensor, the target and the environmental parameters which diminish the amount of power transmitted. Importantly, this equation (Eq. (2)) has been applied as a physical model for the correction of laser intensity data (Yan and Shaker, 2014) in several studies where the equation has been applied either as it is or in a modified form. Substituting Eq. (5) into Eq. (2) results into a squared range which is inversely related to the returned laser signal (Eq. (6)), and independent of the laser beam width (Höfle and Pfeifer, 2007). Where the term K = (PtDr2/4)ηSysηAtm in the original radar range equation (Eq. (2)) is taken to be a constant. The power received, Pr is taken to be equivalent to the recorded laser returned intensity. The reflectance, incidence angle and range parameters are as defined above. Eq. (8) is not an ideal physical model for all scenarios and this is so because for most scanners, the intensity-distance correction tends to be affected more by instrumental effects and these occur either for measurements taken at shorter baselines or those taken at longer baselines (Balduzzi et al., 2011). An investigation which considered faceted surfaces in an attempt to describe surface roughness was addressed in the Oren-Nayar reflectance model (Oren and Nayar, 1994; Oren and Nayar, 1995) which makes a prediction that a surface with facets returns more light in the direction of the light source than a surface with Lambertian properties. For a faceted surface, other than the global normal, each micro-facet has its own normal and orientation. For some surfaces, each facet can actually be a perfect diffuse reflector though this may not be so when all the various facets are combined (Carrea et al., 2016). However, in a case where the various facets are of the same size or smaller than the wavelength, the behaviour tends to follow that of diffuse reflection. But in a case where the facets are of a size that is almost as large as the laser beam spot size, the returned intensity gets controlled by a few facets. Where L is the radiance, E0 is the radiant flux received at normal incidence angle in radians, ρ is the material reflectivity, α is the incoming and ω the outgoing incidence angle, ϕr and ϕi are the reflected and incident viewing azimuth angle in radians and σslope as the standard deviation of the slope angle distribution in radians. This intensity correction (Eq. (15)) can be used for perfect diffuse scattering surfaces. However, for surfaces with micro-facets this correction would not work well and so there is need to integrate the standard deviation of the slope angle since each facet on the surface has its own normal. Thus a hybrid intensity correction model that considers near distance effects and also integrates the Oren-Nayar model is proposed to improve the intensity correction. The data processing and intensity correction method was implemented in Matlab routines. The intensity value is dimensionless and for each block, statistics such as intensity mean and standard deviation were calculated. The average roughness (σslope) values for the blocks were not so far away from 0° as values ranged from 1.15° to 2.58°. Concrete reflectivity measurements were not taken due to non-availability of the spectrometer which would measure reflectivity at a wavelength of 1500 nm (which is the wavelength of the HDS7000 laser scanner used in this study). However, we searched for documentation with concrete reflectivity information at the desired wavelength and information was found in Larsson et al. (2010). Based on this finding, the reflectance of concrete is in the range between 0.300 to 0.400 (Fig. 4) and since the concrete which was used in the study was gray and with some roughness, it was a trial and error of reflectance values from 0.370 to 0.400. The data acquired was analyzed to study for each block the relation between intensity standard deviation and intensity mean as was scanned at the five various incidence angles labelled A to E (see measurement setup in Fig. 3) and results are as shown in Fig. 5 below. Fig. 5: Intensity standard deviation against intensity. Apparently, the standard deviation grows with the intensity mean for each block and this is verified in Fig. 5. Regardless of the scanning incidence angles which were 45°, 25°, 0°, -25° and -45°, the strength of the linear relationship between the two variables in Fig. 5 is strong as can be seen by the values of the coefficient of determination for each block. The minimal variation of the coefficient of determination of the blocks is due to the fact that their surfaces were not totally homogenous because the concrete aggregate cannot be uniformly distributed in all blocks although the same mix design was used. 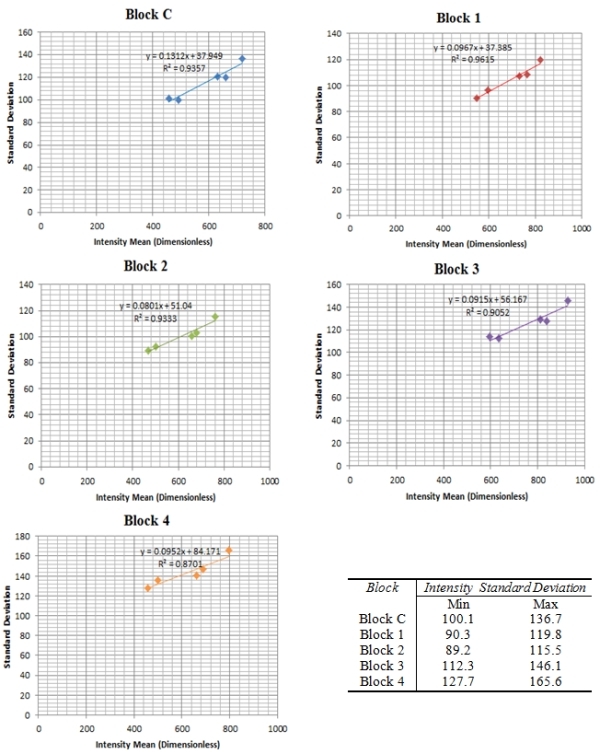 The distribution of the intensity data for the blocks scanned at various incidence angles was as assessed and taking Block C as an example, the results are as shown in Fig. 6. With reference to Fig. 6, two statistical parameters i.e. intensity mean and standard deviations were further investigated in exploratory data analysis of the intensity return at the various incidence angles. The data is normally distributed in all cases and as expected. In terms of the frequency, although the maximum count of 1800 was achievable at all incidence angles, the overall maximum mean intensity return was higher at normal angle of incidence where the point density is also high due to the nature of static TLS. Furthermore, as already pointed out in Fig. 5, the standard deviation grows with the intensity mean in Fig. 6. The blocks were scanned at various incidence angles with the distance at each scanning station held fixed. Fig. 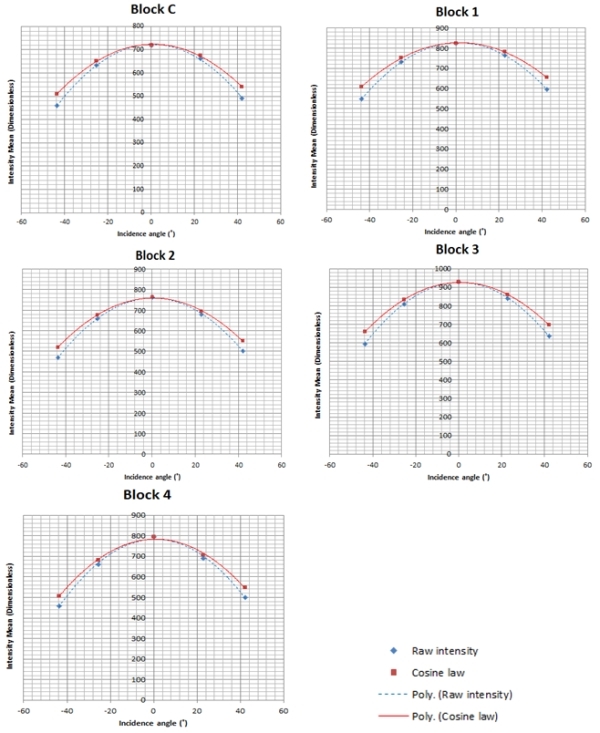 7 and 8 show the resultant relationship between uncorrected intensity for all the blocks and the scanning angle of incidence. Although Eq. (18) is a simplified mathematical law and the light scattering behaviour of all natural surfaces is not Lambertian, the incidence angle dependence for many surfaces is approximated to follow the cos α relation (Kaasalainen et al., 2009b) as exemplified above. The assessment of the distance effects on the intensity involved keeping fixed the various incidence angles and only varying the distances when scanning the concrete blocks. The relationships between the uncorrected intensity and the distance are as shown in Fig. 9. The distance effects on the intensity can be seen since in theory, the returned intensity is expected to decrease with an increase in distance. The plausible reason for the unexpected results was atributed to the instrumental effects at short scanning distances and such results have also been reported by other researchers (e.g. Kaasalainen et al., 2011) although different scanners were used. Furthermore, in the same vein, Höfle (2014) states that past studies on TLS radiometric correction have clearly shown that the range dependence of TLS amplitude and intensity does not entirely follow the 1/R2 law of the radar equation as mostly valid for ALS, in particular at near distance of for instance less than 15 m. The reasons can be detector effects (e.g., brightness reducer, amplification, and gain control or receiver optics (defocusing and incomplete overlap of beam and receiver field of view). However, most manufacturers do not provide enough insight into developing a model-driven correction of these effects. The theoretical contribution of the incidence angle to the deterioration of the returned intensity is plotted in Fig. 10 and it follows Eq. (18). The function 1/cos(α) was also applied and it gave the same result in Fig. 10 and according to Yan and Shaker (2014), this is why the cosine of the incidence angle is commonly taken to be indirectly proportional to the corrected intensity (or spectral reflectance) in the correction process. The relationship between the intensity and the incidence angle as well as Lambert’s cosine law is shown in Fig. 10. 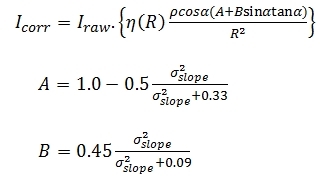 A close correlation between the raw intensity and that with the cosine law is evident though a constant and an offset of the cosine of the incidence angle may have to be added for more accurate results as suggested in Kaasalainen et al. (2011). However, Lambert’s cosine law still provides a good approximation of the incidence angle effects, especially up to about 20° of incidence (Kaasalainen et al., 2009b). Lambert’s cosine law can provide a satisfactory estimation of light absorption modelling for rough surfaces in both active and near-infrared spectral domains, thus, it is widely employed in existing intensity correction applications. However, Lambert’s cosine law is insufficient to correct the incidence angle effect for surfaces with increasing irregularity because these surfaces do not exactly follow the Lambertian scattering law. The incidence angle is related to target scattering properties, surface structure and scanning geometry. The interpretation of the incidence angle effect in terms of target surface properties is a complicated task (Tan and Cheng, 2016). However, Lambert’s cosine law has been successfully applied in some studies to correct the intensity for incidence angle effects. For instance, in Pfeifer et al. (2007) an experiment is reported with an Optech ILRIS3D laser scanner, where one target with near Lambertian scattering characteristics scanned at a distance close to 7m was observed at different angles. The intensity was corrected using the cosine correction and a linear amplification model. 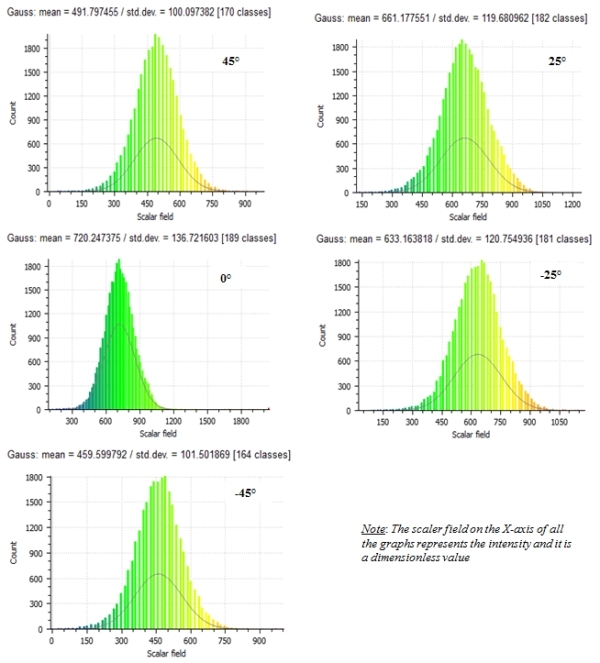 To visualize the effect of the cosine law on the intensity values in overall scale, the average difference between the raw and cosine predicted intensity data points was plotted as shown in Fig. 11(a) for Block C as an example. Fig. 11(b) shows the raw intensity of Block C and the error bars indicate the average standard deviation. Compared to the error range of the intensity for Block C in Fig. 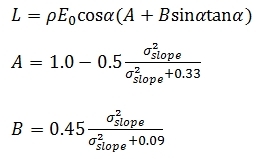 11(b), the difference between the raw intensity and that with the cosine law is still quite minimal, which in percentage terms ranges from 0% at normal incidence angle to about 11% at 45°. This means that the accuracy of the cosine law is sufficient to predict the reflectance at this level of accuracy but may have limitations at higher angles of incidence as already pointed out above. However, the improved intensity correction method did not relay on the cosine law for incidence angle correction since it is insufficient to consider target surface characteristics, and more so its limitations beyond 20° of incidence angle. 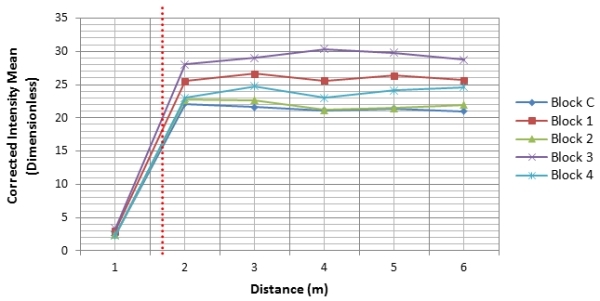 The procedural steps for the improved intensity correction method involve, first correcting intensity data for near-distance effects which are evident in Fig. 9 by applying the near-distance correction method presented above and after that the incidence angle and distance effects on the intensity can be solved separately since they do not mix. According to Fang et al. (2015), in a study where the Z+F Imager 5006i laser scanner was used, the parameters in Eq. (9) have a physical basis and that the derived parameters in Table 2 were estimated in accordance with observed values such as the receiver’s diameter and the detector’s distance from the lens plane by iterative curve fitting using a nonlinear least squares method and robust Gauss-Newton algorithm. However, the values of the parameters differ for the various laser scanners and so each laser scanner needs to be studied. 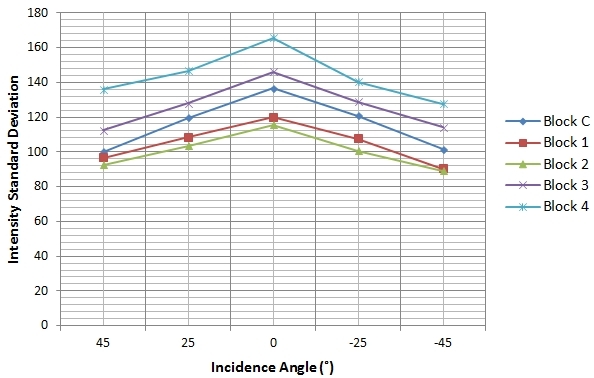 Although the estimated parameters in Table 2 were obtained using the Z+F Imager 5006i laser scanner, the parameters were tested for the HDS7000 laser scanner with success since the two instruments are coaxial and basically identical in terms of their physical characteristics as designed by the manufacturer. Fig. 12 below shows the results after applying the near-distance correction and it can be seen that the correction is valid for distances from 2m and greater since all the other scanning distances investigated follow the theoretical range squared inverse law in relation to the returned intensity and the measured distances. As already alluded to above, instrumental effects such as near-distance reducers (which are meant to avoid over-exposure of the sensor) are known to have an influence on the returned intensity and this actually makes the laser range equation to be inapplicable at all distances as a physical model for intensity correction. Fig. 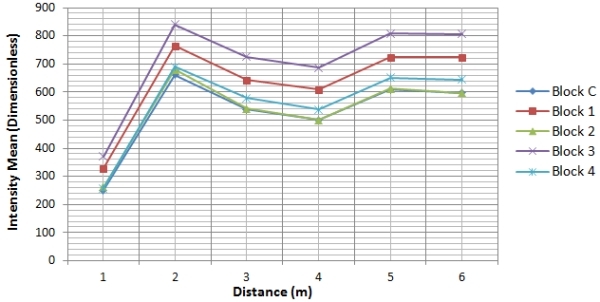 13 below shows the results of the relationship of intensity against distance after applying correction on the intensity data. With the exception of 1m, the correction is valid from 2m and all the other distances that the concrete was scanned from. 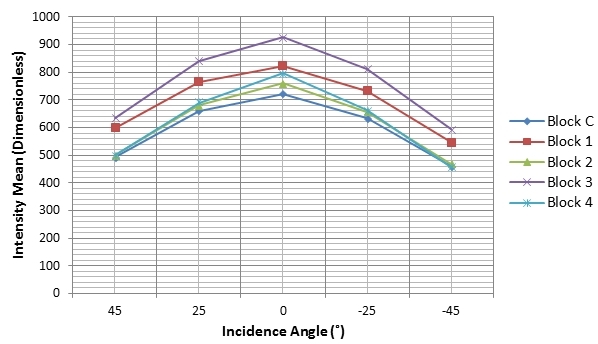 The relationship of the corrected intensity against incidence angle is as shown in Fig. 14. It can be observed that for all the angles of incidence that were investigated, the intensity correction method is valid. The incidence angle effect on the intensity decreased as the graphs for all the blocks tend to straighten cross the whole range of the incidence angles. Although the incidence angle effects appear to have significantly reduced in Fig. 14, the dominance of the reflectance for each block on the incidence angle behaviour can be seen and this could be because the blocks were not completely the same. The effects of the distance and incidence angle on the intensity of concrete specimens have been analysed by looking at the relationship of each with the intensity and they were found to be independent as also reported by some past researchers and this makes it possible to correct both by using different models that are independent of the measurement. Results of the uncorrected intensity and distance relationship have shown that intensity measurements from the HDS7000 scanner at near distances have instrumental effects and several other researchers as mentioned in the reviewed material have reported a similar finding even though different types scanners were used. 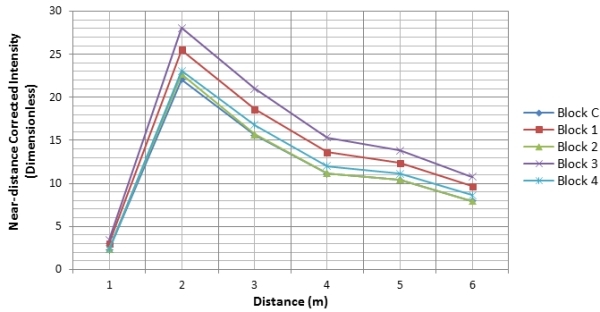 The distance and incidence angle effects for the HDS7000 concrete intensity data were corrected using the improved method and this method has shown the potential to correct the intensity at scanning distances from 2m and greater. The correction of intensity for near distance effects is important for studies that require measurements to be taken at shorter baselines. The raw intensity in relation to that with the cosine law prediction did show a close relationship indicating that the cosine law provides a good approximation of the incidence angle effects and the more reason it is used in intensity correction schemes. However, Reshetyuk (2006) observed that the intensity return decreased with an increase in angle of incidence through experiments carried out using the HDS3000 scanner although the scanned target (a wall) was not Lambertian. It has been reported in some studies that even when the raw intensity may appear to follow the cosine law prediction, there is no guarantee that the Lambert’s cosine law would correct the intensity data for incidence angle effects as for instance pointed out in Tan and Cheng (2016) where a FARO Focus3D 120 scanner was used and a differerent intensity correction method was actually applied. Furthermore, they have stated that the incidence angle is related to target scattering properties, surface structure and scanning geometry and that the interpretation of the incidence angle effect in terms of target surface properties is a complicated task. Surface roughness of the scanned target is also a factor that can influence the returned intensity and the concrete that was used in this study had roughness ranging from millimeters to a few centimeters. Athough the magnitude of concrete roughness may seem to be small, it had an influence though minimal on the intensity correction. An improved intensity correction method such as the one presented could be potentially beneficial in several applications such as change detection, material classification and segmentation. An intensity correction model that considers near distance effects and also integrates the Oren-Nayar model so as to account for target roughness has been presented. The results achieved in the study are promising though more work still needs to be done as pointed out in the section for suggested areas of further research. Several researchers have investigated the subject of TLS intensity correction as shown in the material that has been reviewed and it seems that a standard intensity correction method for all the different types of scanners does not exist yet. However, in Tan and Cheng (2015) it is argued that the proposed correction model can be applied to correct intensity data acquired with any scanner. This calls for more scanners to be tested. The fact that different intensity correction methods have so far been proposed and some of which are complex, implies that the intensity fluctuations for any type of scanner may not be easily modelled. Furthermore, there is need to know what each scanner records, whether it’s the intensity or the amplitude. Instrumental effects on the returned intensity vary depending on the type of scanner and the manufacturer. However, for most scanners, the intensity-distance correction tend to be affected more by instrumental effects and these occur either for measurements taken at shorter baselines or those taken at longer baselines. This implies that the performance of each scanner has to be properly studied. 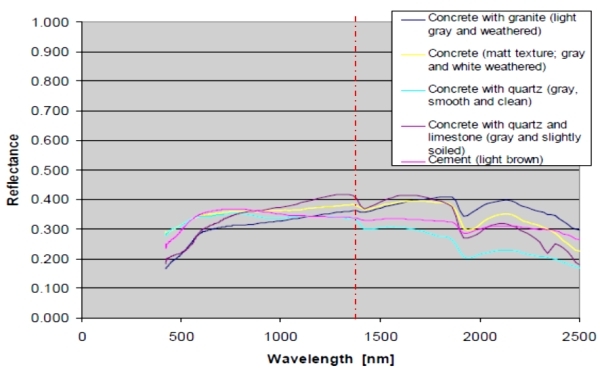 The subject of TLS intensity correction is still an open area of investigation and this research is still on-going and future research will consider using the spectrometer and the VNIR hyperspectral camera (which operate at the wavelength of the TLS) for extracting spectral charateristics of the concrete specimens. The concrete blocks that were used in this study were not significantly rough and so future research work will test the method to correct intensity data of scanned objects with significant rough surfaces and with measurements taken at close range as was done in this study. Furthermore, correction for the incidence angle effects will need to be compared to that based on the linear combination of the Lambertian and Beckmann law. Most TLS intensity correction methods that have been proposed in some past research work have often used targets of known reflectivity such as spectralons for calibration purposes to obtain the device constants or to determine the effects of near-distance reducers. There is need to test some of the correction methods with several natural targets. The Authors express their gratitude to The University of Nottingham Ningbo China for the financial support and massive contribution in terms of the research facilities which made this study to be undertaken and many thanks to the FIG Foundation for co-funding the work through the scholarship which was awarded to the PhD student. Anttila, K, Kasalainen, S, Krooks, A, Kaartinen, H, Kukko, A, Manninen, T, Lahtinen, P and Siljamo, N (2011) Radiometric Calibration of TLS Intensity: Application to Snow Cover Change Detection. International Archives of the Photogrammetry, Remote Sensing and Spatial Information Sciences, 38 (5/W12), 175-179. Balduzzi, M.A.F, Van der Zande, D, Stuckens, J, Verstraeten, W.W and Coppin, P. (2011) The properties of terrestrial laser system intensity for measuring leaf geometries: A case study with conference pear trees (Pyrus Communis). Sensors, 11, 1657-1681. Blaskow, R and Schneider, D (2014) Analysis and Correction of the Dependency between Laser Scanner Intensity Values and Range. The International Archives of the Photogrammetry, Remote Sensing and Spatial Information Sciences, Volume XL-5, 2014. ISPRS Technical Commission V Symposium, 23 – 25 June 2014, Riva del Garda, Italy. Carrea, D., Abellan, A., Humair, F., Matasci, B., Derron, M. and Jaboyedoff, M. (2016) Correction of terrestrial LiDAR intensity channel using Oren–Nayar reflectance model: An application to lithological differentiation. ISPRS Journal of Photogrammetry and Remote Sensing, 113, 17-29. Franceschi, M., Teza, G., Preto, N., Pesci, A., Galgrao, A. and Girardi, S. (2009) Discrimination between marls and limestones using intensity data from terrestrial laser scanner. ISPRS Journal of Photogrammetry and Remote Sensing, 64, 522–528. Habib, A, Kersting, A, Shaker, A and Yan, W.Y. (2011) Geometric Calibration and Radiometric Correction of Lidar data and their Impact on the Quality of Derived Products, Sensors, 11 (9) 9069-9097. Höfle, B. (2014) Radiometric Correction of Terrestrial LiDAR Point Cloud Data for Individual Maize Plant Detection. IEEE Geoscience and Remote Sensing Letters, 11(1) 94-98. Höfle B and Pfeifer N. (2007) Correction of laser scanning intensity data: Data and model-driven approaches. ISPRS Journal of Photogrammetry and Remote Sensing. 62 (6) 415-433. Jelalian, A. V (1992) Laser Radar Systems, Artec House, Norwood, MA USA. Kaasalainen, S, Jaakkola, A, Kaasalainen, M, Krooks, A and Kukko, A (2011) Analysis of Incidence Angle and Distance Effects on Terrestrial Laser Scanner Intensity: Search for Correction Methods. Remote Sensing, 3, 2207-2221. Kaasalainen, S, Krooks, A, Kukko, A and Kaartinen, H. (2009a) Radiometric calibration of terrestrial laser scanners with external reference targets. Remote Sensing, 1 (3) 144-158. Kaasalainen, S, Vain, A, Krooks, A and Kukko, A (2009b) Topographic and distance effects in laser scanner intensity correction, in: Laser scanning 2009, IAPRS, pp. 219–223. Kaasalainen S, Kukko A, Lindroos T, Litkey P, Kaartinen H., Hyyppä J, Ahokas E. (2008) Brightness Measurements and Calibration with Airborne and Terrestrial Laser Scanners. IEEE Transactions on Geoscience and Remote Sensing. 46 (2) 528–534. Krooks, A, Kaasalainen S, Hakala T, and Nevalainen, O (2013) correction of intensity incidence angle effect in terrestrial laser scanning ISPRS annals of the photogrammetry, remote sensing and spatial information sciences, volume II-5/w2, ISPRS workshop laser scanning 2013, 11-13 November 2013, Antalya, Turkey. Larsson, H., Hallberg, T., Elmqvist, M., Gustafsson, F. (2010) Background and target analysis from a Ladar perspective - Reflectance and penetration properties. FOI-R-- 3014 –SE ISSN 1650-1942. Leica Geosystems (2012) HDS7000 User Manual (on-line) http://hds.leica-geosystems.com, accessed on 14th July 2014. Oren, M. and Nayar, S. K. (1994). Seeing beyond Lambert's law. Computer Vision — ECCV '94: Third European Conference on Computer Vision Stockholm, Sweden, May 2–6 1994 Proceedings, Volume II. J.-O. Eklundh. Berlin, Heidelberg, Springer Berlin Heidelberg: 269-280. Oren, M. and Nayar, S. K. (1995) Generalization of the Lambertian model and implications for machine vision. International Journal of Computer Vision, 14(3), 227-251. Penasa, L, Franceschi, M, Preto, N, Teza, G and Polito, V (2014) Integration of intensity textures and local geometry descriptors from Terrestrial Laser Scanning to map chert in outcrops. ISPRS Journal of Photogrammetry and Remote Sensing, 93, 88-97. Reshetyuk, (2006) Investigation and Calibration of Pulsed Time-of-Flight Terrestrial Laser Scanners. Ph.D. thesis, Royal Institute of Technology (KTH), Division of Geodesy, Stockholm, Sweden. Shan, J and Toth, C.K. (2009) Topographic Laser Ranging and Scanning: Principles and Processing, CRC Press. Soudarissanane, S., Lindenbergh, R., Menenti, M. and Teunissen, P. (2009) Incidence Angle Influence on the Quality of Terrestrial Laser Scanning Points. International Archives of the Photogrammetry, Remote Sensing and Spatial Information Sciences, 38 (3/W8), 183-188. Soudarissanane, S, Lindenbergh, R, Menenti, M. and Teunissen P. (2011) Scanning Geometry: Influencing Factor on the Quality of Terrestrial Laser Scanning Points. ISPRS Journal of Photogrammetry and Remote Sensing, 66 (4) 389-399. Tan, K. and Cheng, X. 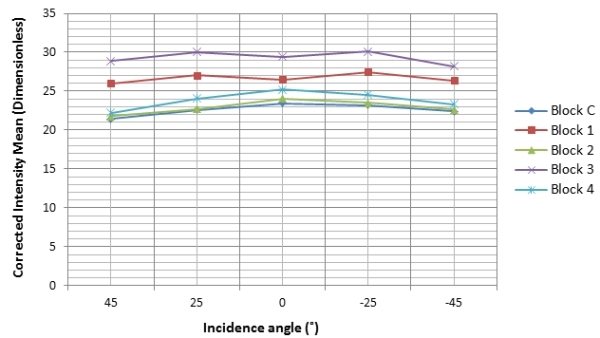 (2015) Intensity data correction based on incidence angle and distance for terrestrial laser scanner. Journal of Applied Remote Sensing, 9, 094094:1–094094:22. Tan, K. and Cheng, X. (2016) Correction of Incidence Angle and Distance Effects on TLS Intensity Data Based on Reference Targets. Remote Sensing, 8 (3) 251. Yan, W.Y and Shaker, A. (2014) Radiometric Correction and Normalization of Airborne LiDAR Intensity Data for Improving Land-Cover Classiﬁcation, IEEE Transactions on Geoscience and Remote Sensing, 52 (12) 7658-7673. Zhu, X., T. Wang, T., Darvishzadeh, R., Skidmore, A. K. and Niemann, K. (2015) 3D leaf water content mapping using terrestrial laser scanner backscatter intensity with radiometric correction. ISPRS Journal of Photogrammetry and Remote Sensing, 110, 14-23. 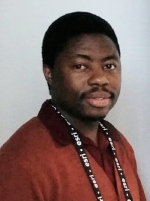 Wallace Mukupa is a post graduate research student in the Department of Civil Engineering at The University of Nottingham, Ningbo, China. He is currently pursuing a PhD in Engineering Surveying of civil structures. Gethin W. Roberts is a Reader in Geospatial Engineering at The University of Nottingham, United Kingdom. He is the UN Delegate for the FIG through the Chartered Institution of Civil Engineering Surveyors. He is a past chairman of FIG Commission 6. Craig M. Hancock is an Assistant Professor in Geospatial Engineering at The University of Nottingham, Ningbo, China. He is also involved with the International Federation of Surveyors (FIG) and has been a Vice Chair for communications on Commission 6 (Engineering Surveys) from 2010 – 2013. Khalil Al-Manasir is an Assistant Professor in Geospatial Engineering at Middle East University, Amman, Jordan. He has worked at The University of Nottingham, Ningbo, China before as Assistant Professor. The University of Nottingham, Ningbo, China.